You brother and sister-in-law are so special to allow that to happen. Thanks for sharing the story & pictures from your sister, Gigi! I think the tree looks adorable with the kitty decorations on it. Sorry these 2 are making so much work for your sister & giving her so many headaches! When Freya and Lara came to our house I immediately thought the Christmas tree would need some cat-proof decorations. I found beautiful unbreakable ornaments and the tree looks great. But to my surprise the girls paid no attention whatsoever to the tree and the bling. Could have used the most fragile glass objects and nothing would have happened to them. When we had five kittens (!) we had home-made decorations; I made them with the children (back in '83 ) of salty dough. That was a wise decision, all five loved to climb the tree, preferably all at the same time. 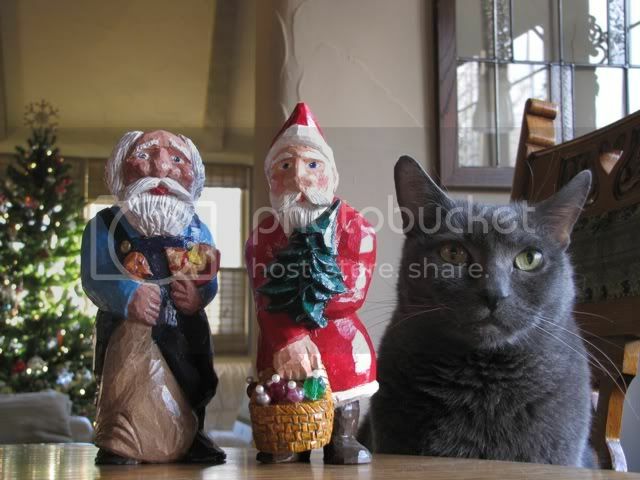 Thanks for sharing the great cat in Christmas trees stories and thanks for the pictures Gigi. My cats have settled in to accepting the tree- it so much fun to lay under- but they still bat at the ornaments near the bottom, so those are made of wood or fabric. My delight is that Jack loves to untie the bows and munch on the end of the ribbons. Presents have to be piled up on an end table to keep them safe which is actually lovely, and a room decoration in itself. gigi, I'm laughing out loud at reading your sister-in-law's funny and clever description of her Christmas tree adventures the last two years. Thanks to both of you for the chuckles. This is my all time favorite Christmas tree Mick!! Happy Holidays from mine to yours. Wow, I have enjoyed catching up on this thread-thanks to all!! Wonderful pic/photo Mick of the "Cat" tree! PLEASE CONTINUE YOUR POSTS IN THE 2011 TOPIC! HAPPY NEW YEAR!